There are lots of reasons to try deep-water fitness, but these are our top 5. It’s a great cardio exercise, by swimming you raise your heart rate and over time this can help prevent against all sorts of diseases, including Type 2 diabetes. Unlike other forms of cardio that cause varying degrees of impact to your body, a deep-water workout is relatively low on the impact-stress scale; protecting your bones and muscle. When you swim, you use almost all the muscles in your body, even more than you would use on land. Meaning your deep-water exercises work for weight loss, muscle toning, and, in general, boosting your fitness efforts. Like all types of cardio exercise, swimming is excellent at helping your brain release those de-stressing chemicals making you feel better, sleep more efficiently and handle daily stress better. But what is unique is the feeling it gives you from being in the water, away from the usual stresses of everyday life. Complete with brain-calming chemicals, swimming has one advantage on the exercise scale over comparable activities such as spending time in the gym––it’s super fun and accessible for everyone who knows how to swim! Since childhood, we are trained to consider swimming as an enjoyable activity, unlike the gym (though many people also enjoy it) we are not conditioned to think of swimming as a chore, only something fun. Add these fun pool-friendly activities to your deep-water workout routine to boost your health, mood, and body. We can’t wait to try them too; roll on summer! There’s nothing wrong with the classics, that’s why it’s essential to combine these cardio-active classics into any routine. Breaststroke––this is what people think of when they think swimming, a simple yet effective technique to move you through the water with grace. With your chest in the water, use your arms and legs to push your body forward. Turn your head from side to side, in line with your movements to draw breath when needed. Backstroke––lying on your back, you propel yourself through the water using your legs, kicking them as you go, and your arms which form propeller movements above your head. Remember, to be careful to watch where you’re going at all times, even if it does slow you down. 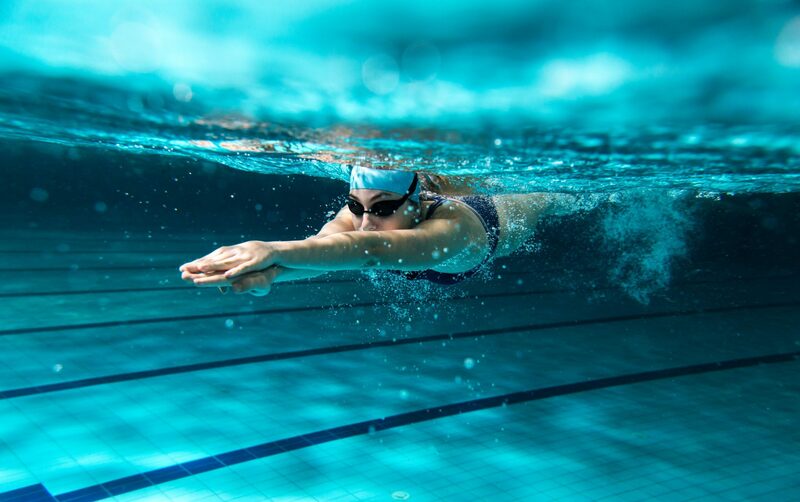 Butterfly stroke––one of the toughest, but fastest swimming styles out there, the Butterfly stroke utilizes all the bodies muscles to push your body forward through the water, then upward gaining breathe, before diving back down and propelling further forward. It gets its name from its movements, which look similar to a butterfly’s wings. Treading water––while not a swimming style exactly, learning how to tread water can build your endurance in the water, and even save you in a life-threatening situation; which is why it holds its place on many swimming endurance tests. As you do each of these activities, try to focus not only on your movement but also on your breathing. Keep practicing, and you will notice your lung capacity has improved, leaving you feeling less out of breath for your land-based exercises. Combine the classic with these fun, yet tough, pool aerobics to get the most from your routine. There are tones more styles out there, but these are our favorites. Why not leave a comment to tell us yours? Jogging––Find a shallower area of the pool, one where the water reaches your chest, but not higher, and start jogging on the spot. The water pressure will make this more difficult than usually running, but also a whole lot more fun. Jumping Jacks––Similar to jogging, doing jumping jacks under water, helps to build your muscles tone effectively. Squat jump––Again in chest-high water squat down, going below the surface, before pushing up to rise through the water. You’ll feel almost like Superman!